As I write this, St. Andrews Day is drawing to a close in Scotland. While it is not yet a national holiday, it is a day when the patron saint of Scotland is honored, and is considered to be Scotland’s national day. After the crucifixion of Jesus, Andrew, brother to (St.) Peter, traveled in the areas around the Black Sea, preaching the gospel. He was eventually crucified himself, but he felt he was not worthy of being crucified on the same type of cross that Jesus was, so he requested the “X” shaped cross as his method of execution. There are a couple of different versions of legends about how some of the relics of Andrew were brought from Constantinople to the eastern coast of Scotland. One legend tells of how St Andrew’s relics were brought by St Regulus around 750 AD by sea to a settlement in Fife. At that time, Fife was Pictish Kingdom under the control of King Angus Macfergus, Óengus mac Fergusa. The problem with this is that the only Regulus found in historical records came to Scotland with Columba more than 100 years before King Angus ruled. Another legend is that they were brought by St Acca, who had been Bishop of Hexham (in England) until his unexplained exile in 732. One tradition says he became a bishop in Galloway, Scotland, while another says he founded a see on the site of what is now St. Andrews, and he brought with him the relics which he obtained when he had been in Rome. King Óengus I established a monastery in the mid-eighth century with the relics: bones that are supposed to have been St. Andrew’s (arm, kneecap, three fingers and a tooth). According to the legend, in 832 AD, Óengus II led an army of Picts and Scots in battle against the Angles under King Athelstan in what is now East Lothain. He was heavily outnumbered; and when praying on the night before the battle, he vowed to make St. Andrew the patron saint of Scotland if he were victorious. In the morning, white clouds formed an X shape in the sky. Óengus saw the cloud formation as the “X” cross upon which St. Andrew had been crucified, and was encouraged by the apparent divine intervention. His forces won the battle, and he followed through on his pledge. Legend continues that it was this vision that led the Scottish flag to be designed as a white St. Andrew’s cross (Saltire) on a blue background. It seems that it’s also legend that the battle was won by the Scottish forces. History shows that the battle was actually lost, and quite badly at that. It also took place in 937 AD between the forces of Constantine II and Athelstan, who was (the first) King of England, not just the Angles. Another version of the story was written in The Scotichronicon (a history of Scotland) in the 1440s by Walter Bower. He writes that the cross in the sky was seen by the Pictish King Unust, who was fighting the Northumbrians in 761. In 877, king Constantine, Causantín mac Cináeda, built a new church at St Andrews. The connection between Scotland and St. Andrew had been made stronger during the seventh century as the Church began to follow the holy days schedule of Rome as opposed to those of the Celtic Church which was centered on Iona. St. Columba was most important to the Celtic Christians, as St. Peter was to the Christians of Rome. Having the brother of St. Peter become the most important saint in Scotland may have been a good compromise. Saint Margaret of Scotland (was married to King Malcolm III in 1070) had a lot of influence in promoting the Roman church in Scotland over the Celtic Church, and St Andrew was very popular in her Hungarian homeland. In 1320, Scotland’s conversion to Christianity is acknowledged in the Declaration of Arbroath as having been by Andrew, “the first to be an Apostle”. As for the town itself, the first recorded name for the area is Muckross , Mucrois, (“Boar’s head/peninsula”). A religious settlement was founded in Muckross around 370 AD, and the name was changed to Cennrígmonaid (cenn (“head, peninsula”), ríg (“king”) monaid (“moor”). This later became Cell Rígmonaid (cell “church”) –anglicised to Kilrymont. Modern Gaidhlig is Cill Rìmhinn. The town was re-named to honor the Saint, and in 906 AD, it became the seat of the bishop of Alba. 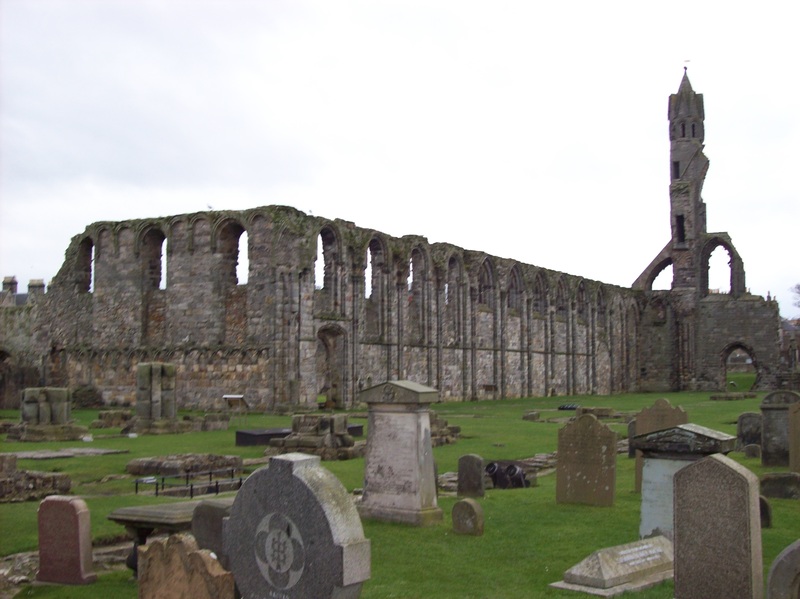 In 940 Constantine III abdicated and took the position of abbot of the monastery of St Andrews. There was some flexibility in the shade of blue that has been used historically for the Scottish flag, ranging from a light sky blue to a deep navy. The shade of Pantone 300 was proposed by Scottish Parliament in 2003 and is becoming the standard color. 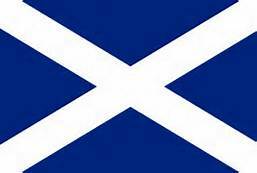 Of course, the St Andrew’s cross is not only used on the flag in Scotland: superstition uses the cross as a hex sign. In northern England and Scotland a cross was carved in the fireplace post or lintel to prevent witches from flying down the chimney. Its use was similar to that of the witch ball, which delays or even entices the witch so that she can be entrapped in the ball. The cross, however, works to prevent the witch from entering at all. This entry was posted in Ancestry, Eco-travel, Ecology, Highland Titles, Land trust, legend of saltire, Scotland, Scottish ancestry, Scottish flag, Self drive Scotland tours, St Andrews, Travel, Uncategorized, Women Writers. Bookmark the permalink.